One of the most expected models of the year. It is first phone from Siemens with a colour display and bluetooth support. 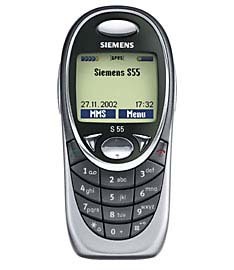 Besides Siemens S40 (elaborating of Bosch), Siemens S55 is the first phone of this company which is a tri-band phone. An external camera, which can be switched to a system connector, is available as an extra accessory. Graphical display, which can show up to 256 colours, it has a resolution of 101х80 pixels, what allows to display up to 4 text lines. Application memory is dynamical, free space can be also used to transport files. Up to 5 caller groups, 3 of them are changeable, the other two are out of group and received. One can assign a special icon and a ringtone to each group. Phonebook: up to 500 phone numbers+ SIM-card memory. Up to 14 fields can be added to one name. For example, a user can add several phone numbers, post address, URL, 2 e-mails, birthday. One can set a reminder to birthdays. It's also possible to assign a graphic picture to each name in the phonebook. Voice memo. A possibiity to assign records to organiser events or alarm-clocks. Organiser with different types of events. Maximun length is 50 characters for one event. One can set reminders, including recurrent reminders. Monthly, weekly and daily calendar view is available.